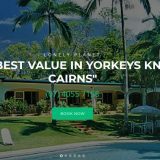 Cairns most unique motel accommodation – at Motel Nomad we’ve reimagined the ’roadside motel’ by combining modern furnishings with minimalist design to create a stay that is friendly, casual and above all, comfortable. 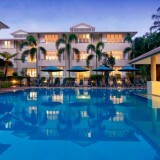 Our newly renovated, Queenslander inspired, motel with 30 year-old bones is set in a relaxed palm-filled compound. The property features 54 suites, studios, apartments as well as event spaces, breakfast. dinner, spa and lagoon style pool. 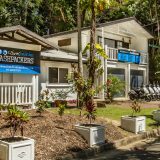 So close yet so far out – we’re positioned between the DFO Shopping Centre and Cazalys Social Club in the centre of the commercial area, only a 5 minute drive from the Cairns Esplanade and Cruise Terminal. A great location to be based for those exploring or working during their stay.